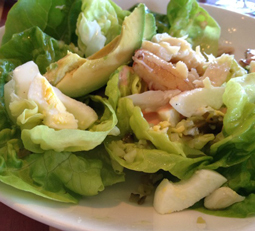 Crab Louie Salad - A recipe from Savor California, the online showcase for extraordinary gourmet foods and beverages from California. Combine the mayonnaise, ketchup and lemon juice in a bowl. Mix with a whisk until well combined. Add Tabasco, salt and black pepper to taste. Refrigerate until needed. Put the green onion and the mustard into a small bowl. Whisk in the lemon juice and the vinegar until combined. Slowly drizzle in the oil while continually whisking until all is incorporated. Add black pepper and season with salt. Let the dressing stand for an hour, then strain to remove the green onion. Reserve. First, remove the stem from the butter lettuce. Carefully wash the leaves to remove any excess dirt and spin dry. Dress the leaves with the vinaigrette, making sure to cover every part of the leaves. Arrange the lettuce in four bowls, starting with the large leaves on the bottom and moving to the small leaves to form the shape of a flower. Using a spoon, sprinkle the cornichon and the celery evenly on top of the four salads. Arrange 2 quarters of egg on each salad. Marinate the crab meat with a little of the vinaigrette and distribute evenly between the four salads. Drizzle the louie dressing liberally over each salad. Place the remaining louie dressing on the table for those who enjoy a little extra with their salad. Arrange the avocado slices on the salad just before serving. Season with salt and pepper and then fan out on top of each salad.